Soon the local churches will begin advertising their Fall Festivals so lately I have been wondering what type of costume to make this year for Halloween. 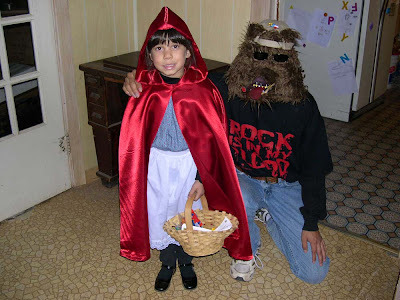 Last year Elizabeth was Little Red Riding Hood and Jonathan was the Big Bad Wolf. 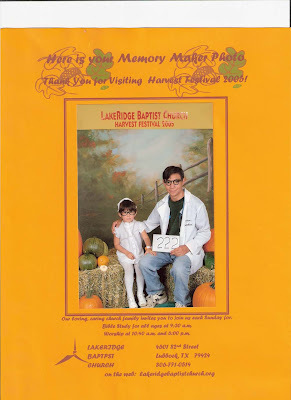 Another year Jonathan dressed as a doctor and Elizabeth as a nurse. We are thinking about a Priest and a Nun or an Amish boy and girl for this year. I have had a couple requests for my Banana Bread recipe; it came from the book Treasured Recipes by Lubbock Christian College Associates. I received this book as a wedding gift 25 years ago and have used the recipes in the book so much the spine is broken and the pages are very stained. I use 1 stick of margarine instead of 1/2 cup shortening. I use regular milk instead of sour milk. I add my baking soda to my flour instead of the mashed bananas. I like to bake my banana bread in a long narrow pan so the middle of the bread can cook before the outside of the bread begins to get too brown. Well, our very long very nice weekend is over and the wedding was wonderful. 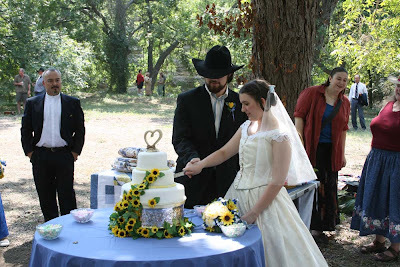 The couple had a Pioneer Wedding at an historical museum in Austin. They met for the first time while volunteering at the museum. 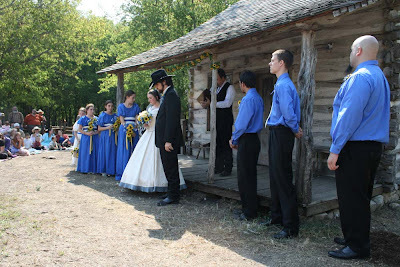 They married outside an old German Cabin. 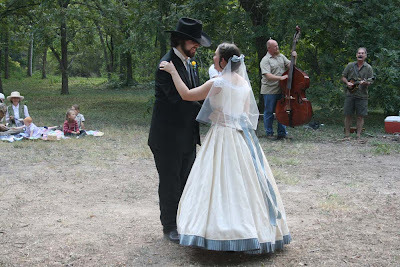 The reception was held through the woods down by the creek; they danced to a Bluegrass Band. The cake was simple and elegant. Everyone had a wonderful time sitting around on old benches and quilts; it was very much a picnic style reception. It was so nice visiting with family and friends but it feels so good to be back home. Saturday my nephew is getting married in Austin. Elizabeth and I spent much of today and yesterday getting the house in order and packing our things. Now all we lack is for Jonathan to pack and we will be on our way by noon on Thursday for a long weekend of celebration, good food and a semi-family reunion. And today is that day! The house smells so good; there isn’t a Yankee candle on the market that can match this smell. Today's bargain is a new dress. I love how comfortable it is. The cost was a whopping 45-cents! 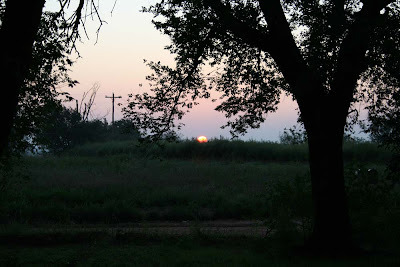 Today I stepped outside and took a picture of the sun as it was coming up. Were getting closer to Hot Chocolate Mornings. Last night I was up quit late working in the sewing room; an embroidery customer needed little cheerleader tops embroidered ASAP. It was after 1AM by the time my head hit the pillow. But it was so worth it knowing that 13 little girls would be jumping and cheering while dressed in style. The chickens are quickly approaching maturity so we have moved them to a new home. We have used this old hen house off and on for years and it feels good to have it in use once again. The inside is very spacious. There is plenty of room for egg boxes, a feeder and water supply. My favorite part of housing chickens in there is the ladder we have set on an angle; I love seeing the chickens roost on it. Any day now we are expecting to find freshly laid eggs. Here is how I make oven roasted potatoes. I learned how to make these while visiting my sister-in-law Cathey. Begin with raw potatoes that have been scrubbed and all blemishes removed. Cut them into wedges and place in a plastic bag. Drizzle oil over the potatoes and then sprinkle on creole seasoning and black pepper. My sister-in-law used a 7-pepper blend but I have not located this at the store yet and black pepper has been working fine. Close the plastic bag and shake very well. This step evenly coats the potato wedges. Now place them in an oven proof dish. Bake at 400-degrees until the potatoes are tender. I like to make extras so we can have them again the next day with lunch. Today's bargain is a wonderful book by James Harriot. I love his stories and have listened to several of his Books on Tape while working in the sewing room. I paid $1.50 for my new book; just under 7-percent of the list price. Elizabeth is going to love having me read these stories to her. School time works well for handwork since I need to be next to Elizabeth. It feels good to complete another project on my long TO DO LIST. Last night I sandwiched and pin basted this quilt; it took all day to complete the quilting. The sashing has vertical and horizontal quilting and each crazy block has stippling. The backing is Heather Bailey that my local quilt store had in stock. I love how the quilting stands out on the back. Thank you Tallgrass Prairie Studio for your crazy block tutorial. I am so anxious to begin another quilt like this one for myself. This morning I made myself a new pincushion by following a tutorial on Crazy Mom Quilt's blog. The pincushion has been stuffed with cotton we picked from a field next to our house last year. The kids helped to remove all the seeds so the cotton would be soft enough to use. The tutorial for making a pincushion was very simple but I made two changes; the first change was to add a felt bottom. The second was to line the top of the pincushion with muslin so the outer fabric would be thicker. I am pleased with how it came out. Several years ago I came across this recipe for homemade vanilla. Simply cut a long slit into several vanilla beans and soak several months in vodka. I have found the vodka brand Crystal Palace to work the best and vanilla beans can be purchased very inexpensively on e-bay. The longer the vanilla ages the stronger it becomes. Today, while in town for Elizabeth's dance class, I found several bargains. The first was this enamel dishpan; I paid 25-cents for it. My next bargain was this quilt; I paid $3.61 for it. While at the grocery store I scored very well using my coupons. All items seen here, minus one of the frozen pizzas, rang up $45.70; after my coupons my grand total was $17.65! Now I'm off to begin mending the quilt. After many hours my star quilt is now completed! I love the way it turned out. For the machine quilting I stepped away from Stippling and tried my hand at Free Form quilting. Free Form quilting really brought out the beauty of the quilt. I am so glad I decided to try this type of machine quilting; it wasn't as hard as I had expected it to be. Each star block has its own style. The outer white border has stars outlining the entire quilt. Each time I handle the quilt it makes me want to stop and snuggle under it. 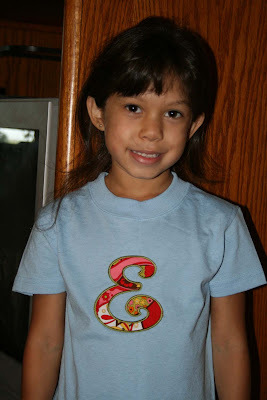 I recently ordered a new set of applique alphabets for my embroidery machine. The design stitched out wonderfully... And Elizabeth is happy with her new T-shirt.